SALT LAKE CITY, UT – Today the Salt Lake Chamber and its clean air partners kicked off the 9th Annual Clear the Air Challenge. The Challenge, issued by business, government and community leaders, is a month-long competition designed to encourage Utahns to reduce their vehicle emissions by choosing alternatives to driving alone. And for the first time, the Clear the Air Challenge will be held during the month of February, when our air quality is visibly at its worst. Transportation emissions are responsible for nearly fifty percent of the pollutants that make up our poor air quality. By reducing vehicle trips, we can protect our health, environment, economy and quality of life. That’s why participants of the Clear the Air Challenge use TravelWise strategies like carpooling, using public transit, teleworking, trip chaining, walking or riding their bike, and, new this year, using electric vehicles, to reduce their emissions and help clear up Utah’s air. Since the Challenge started in 2009, participants have helped make a big difference in improving Utah’s air quality. In that time, almost a million trips have been eliminated, 13.6 million miles were saved, 4,700 tons of emissions were reduced and more than $6 million was saved. Business and organization participation is a key component of the challenge. By encouraging employees to participate, businesses can create a team to make an even bigger impact. Employees from last year’s winner, Fidelity Investments, prevented 492 tons of emissions from entering the air. Ultimately, we all breathe the same air and want it to be healthy. By working together, we can continue to make progress in cleaning up Utah’s air. That’s why this year Mark Miller Subaru is also participating in the Clear the Air Challenge. Tracking your miles during the Clear the Air Challenge from your mobile device or computer is easy thanks to the TravelWise Tracker. Once you register for the challenge at ClearTheAirChallenge.org you can enter in a starting and ending location and receive carpool options, transit routes, or biking and walking routes. The TravelWise tracker gives the amount of emissions you’ll save and the time it will take to make your trip. The Clear the Air Challenge starts February 1st. Register your team of coworkers, family or friends at ClearTheAirChallenge.org and be part of the solution. Originally published by Fox 13 Salt Lake City on January 29, 2018. SALT LAKE CITY – Utah Corporations and other organizations are gearing up to ramp down their driving for the month of February, in an annual competition aimed at helping clean up the air along the Wasatch Front. Utah’s Clear the Air Challenge will last through February this year, with corporate teams taking trains, buses, bikes, and walking to work. For six of the last seven years, the Fidelity team has taken home top honors. “We have a lot of pride in that. It comes with a lot of work,” said Fidelity team leader Carly Seely. Seely says the University of Utah has been their strongest competition over the years. The Utah Clean Air Partnership organizes the event, in which participants keep an online journal of their actions to combat pollution. “Everybody’s the problem so everybody needs to be the solution,” said UCAIR Executive Director Thom Carter. Originally published by ABC4Utah on January 29, 2018. SALT LAKE CITY (News4Utah) – Starting February, community leaders are challenging you to help be part of the air quality solution. In a press conference Monday afternoon, the Salt Lake Chamber and its clear air partners kicked off the 9th annual Clear the Air challenge. The challenge is a month-long competition designed to encourage Utahns to reduce their vehicle emissions by choosing alternatives to driving alone. For the first time, the challenge is held during the month of February. 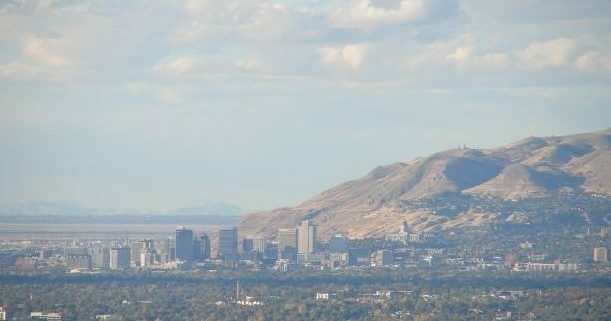 Staff with the Salt Lake Chamber say that’s when the air quality is visibly at its worst. According to Beattie, transportation emissions are responsible for nearly fifty percent of the pollutants that make up our poor air quality. He acknowledged that other big cities face the same problem, but there’s one addition problem that Utah has. “We’re in the Great Basin. So it’s a little harder to clean that out with breezes and what they have coming into the ocean or some other place,” said Beattie. “This is probably the cleanest air we’ve had in a hundred years. The reality is we’re much more aware of the costs of bad air and pollution and what that does to us,” said Beattie. Participants can track their miles during the Clear the Air Challenge from their mobile device or computer using the TravelWise Tracker. You can register for the challenge by visiting http://cleartheairchallenge.org. The TravelWise tracker allows participants to enter in a starting and ending location to receive carpool options, transit routes, biking, and walking routes. It can also give the amount of emissions saved and provide the amount of time it will take to make the trip. Originally published by the Deseret News on January 29, 2018. SALT LAKE CITY — The Salt Lake Chamber kicked off its ninth annual Clear the Air Challenge on Monday. “We’re very excited about the announcement, because … it is taking place in February,” said Lane Beattie, president and CEO of the Salt Lake Chamber. In the past, the challenge took place during the summer. In February, “our air quality is visibly at its worse,” the chamber said in a news release. “The challenge is … a monthlong competition that is designed to encourage Utahns, who go to work … and take kids to school every day to reduce their vehicle emissions by choosing alternative(s) (to) driving,” Beattie said. “We know transportation emissions are very, very critical to the airshed that we have. Over 50 percent of the issues that we have come out of the tailpipe of a car. We really do believe that by reducing the vehicles on the road and the vehicle miles can make a significant difference,” he said. “There’s no greater health threat to our community than our air quality,” Beattie said. Cleaning Utah’s air, he said, is an economic issue. 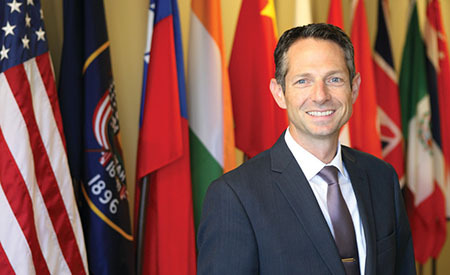 Scott Williams, executive director of HEAL Utah, said “Salt Lake has had 164 mandatory air action days, or an average about 30 days every year,” over the past five years. “… Half of our toxic emission in the air comes from our cars. So for those 30 days every year, we each need to have a plan B alternative to driving alone,” Williams said. “The Clear the Air Challenge is a way to practice our personal plan B and hopefully eventually make it our plan A, and reduce the the output of toxins … that our cars emit by working from home, taking public transportation, carpooling, combining our errands into fewer trips, or using our foot power to walk or take our bike,” he said. Utah residents can visit cleartheairchallenge.org to register for the challenge. The website tracks the miles saved by all participants. Originally published on January 23, 2018 by UCAIR on KSL.com. If you have a 60-mile daily commute, you could save $4,388 annually if you carpooled with another person. Even if you can’t carpool every day, aim for once a week. There are easy resources, such as the TravelWise Tracker and UTA’s RideShare Program, to get you started. Did you know that if you ride transit just once a week, you can reduce emissions by 5.4 pounds? Riding transit in Utah is easy and convenient. Not only are you improving the air quality, but you also earn significant “me-time” by letting someone else drive. Choosing to never idle your car is perhaps the easiest lifestyle change you can make on this list. Research indicates that the average person idles their car five to 10 minutes a day. Cutting idle time makes sense during inversions, because reduced idling also reduces the emissions of nitrogen oxides (NOx) and volatile organic compounds (VOCs), both precursor gases for the formation of PM2.5 during inversions. If you are going to stop your car for more than 30 seconds, turn off the engine. By planning ahead, you can save significant time and money on your commute. UDOT Traffic communicates Utah’s traffic status to the public by using more than 700 overhead traffic cameras and 1,500 in-road traffic sensors on all major UDOT roads. Utilizing alternative work schedules — such as leaving 15 minutes later — can save you serious time when it comes to your commute when you plan ahead. In February, companies all across the state of Utah will participate in the Clear the Air Challenge. The goal is to eliminate 300,000 single-occupant trips to save two million miles. Encourage your company to participate with a startup toolkit that contains resources to spread the word. There’s nothing like friendly competition to encourage your coworkers to clean up their act when it comes to air quality. While our air quality is affected by numerous little acts, we have the power to improve air quality based on our little acts. If all Utahns work together to make small changes to our current routines, we can make a difference in improving the air we breathe. Originally published by Derek Miller, World Trade Center Utah, on Utahpolicy.com on January 21, 2018. You may not equate economic prosperity with air quality, but you should. Air quality is an important economic issue. Poor air quality hinders corporate relocation efforts, places additional regulatory burdens on businesses, increases health care costs and puts Utah’s federal highway funding at risk. Improving our air quality is essential to maintaining Utah’s quality of life and economic prowess.That’s one message Thom Carter, executive director of UCAIR, the Utah Clean Air Partnership, emphasized when I visited with him last week. While his career has taken him all over the country and world, Thom loves the Beehive State’s quality of life, fantastic landscape and economic strength. In the few years he’s been back in the state, he’s come to love “the Utah way of getting things done,” referring to our many public/private partnerships.Thom describes UCAIR as a state-wide clean air partnership created to make it easier for individuals, businesses and communities to make small changes that improve Utah’s air. The organization strives to raise awareness through public education, grants and partnerships with businesses and other organizations to promote changes that will improve our air quality. For example, with more than half the state’s air pollution coming from vehicles, individuals and businesses can make a significant difference in our air quality simply by changing their driving habits. According to the Utah Division of Air Quality, if all drivers living along the Wasatch Front were to park their cars just one day per week, vehicle emissions would be reduced by 6,500 tons per year. Thom says there are no perfect answers, but there are practical solutions. Driving less, carpooling, using mass transit and telecommuting – those are practical solutions that make a difference. He points to the Utah Clear the Air Challenge as another solution that is working well. The Challenge begins Feb. 1 and is a month-long competition that gives individuals and businesses the chance to reduce vehicle emissions by choosing alternatives to driving. Results from the 2016 Challenge showed that the 2,281 participants reduced C02 emissions by 492.6 tons for the month of February. “It all boils down to one person, one business at a time,” Thom continues. UCAIR will hold its third annual summit on Feb. 21 at Rice-Eccles Stadium from 6:30-9 p.m. NBA Hall of Famer Bill Walton will keynote the event. Bill is a lifelong fan of Utah and its unparalleled outdoor recreation. Participants will gain insight into UCAIR’s progress, grants and updates. UCAIR will also recognize the “Clean Air Person of the Year,” “Clean Air Business of the Year,” and “Clean Air Partner of the Year.” For more information on the summit, contact Mike Deaver at 801-245-9329 or Angie Koford at 801-660-8571. A Little Competition is Healthy. Start from the Top. Originally published by the Salt Lake City Economic Development on January 19, 2018. Sometimes a little competition is just what you need to jump-start new habits. While Utah’s air quality is no laughing matter, the challenge is one way to amp up your daily routine and see how many miles and dollars you can save just by making more air-conscious decisions. Clear the Air Challenge starts February 1st. And you can sign up your company for the team challenge. Get your employees and coworkers involved and see how easy it is to reduce emissions and help Utah’s air. It’s easy to get started. Create an administrator account and have individual teams under one workplace. Competition could be for overall participation or based on % within your department. Or you can opt to compete for calories burned, $ saved, miles traveled, etc. Prizes could be anything from cash gift cards, something with a sustainability theme like a bike light or a water bottle, or even an extra day off work. It could also be lunch with the boss or a certificate. Clear the Air Challenge has made it easy with their business tool kit – it has all of the communication materials you need to send out to staff. Check back daily to CleartheAirChallenge.org to see the top winners in our business community. By signing up you will receive updates to let you know where your team stands in the running. Communication is key. Make the Challenge an agenda item for your internal meetings, send weekly reminders to staff – the more airtime it gets the better your team will do. Work with your employees. Help them identify opportunities for carpool matching, public transportation and flexible work arrangements, if applicable. Emphasize the impact. When you look at the emissions you can save by being involved in the Challenge, and when you look at the way we can improve our state, I think that is an easy thing to communicate to employees. Don’t be afraid to just give it a try. My advice is to try it – the tools are provided for you. Put a committee together of people who believe in the issue – champions in your organization who can help share the message. Salt Lake City Green has very helpful resources to keep your team informed. They recommend keeping these key tactics in mind: Carpool, take transit, telework, support active transportation, trip chain, and consider clean air vehicles (electric vehicles) for personal and fleet. Share your progress on social media. Follow SLC Green, Salt Lake Chamber, UCAIR, Clear the Air Challenge, and other community clean air leaders. Share their content on your channels. http://cleartheairchallenge.org/wp-content/uploads/bikeguy.jpg 459 736 Marisa Bomis http://cleartheairchallenge.org/wp-content/uploads/2017_CTAC_LOGO_Still-01.png Marisa Bomis2018-01-19 23:07:452018-01-30 23:10:18A Little Competition is Healthy. Start from the Top. Originally published on January 18, 2018 by KSL.com. We’ve all seen it — and breathed it, but what if there was something we could do to clean up Utah’s dirty air? The good news is, there is something we all can do to help create a better tomorrow, with cleaner air for our neighbors, children and grandchildren. While Utah’s poor air quality is exacerbated by our geography that creates the inversions; it’s the emissions that get trapped in the inversions that are harmful to our health. So to clean up our air, we need to reduce our emissions. It’s that simple. That’s why the Salt Lake Chamber is encouraging everyone to take part in the Clear the Air Challenge, a month-long competition that starts Feb. 1 and gives participants the chance to reduce their vehicle emissions by choosing alternative methods of transportation. By driving less and driving smarter, which includes carpooling, telecommuting, taking public transit and more, we can see a significant reduction in our bad air days. For example, if all drivers living along the Wasatch Front were to park their cars just one day per week, vehicle emissions would be reduced by 6,500 tons per year! Reducing the number of cars on the road leads to improved air quality. As you change individual behavior to reduce your trips, and as you challenge your family, friends, neighbors and co-workers to do the same, you can collectively reduce emissions, improve our air quality and the well-being of all Utahns. Small actions add up to make a big difference for our air. A recent survey of Utah employees found that poor air quality is a top concern across the state. More than just a competition, participating in the challenge is the perfect way for your company to show a commitment to a cause your employees care about — improving air quality. Demonstrate good corporate citizenship by taking action to make a difference. Did you know, if a person with a longer than average commute (e.g. more than 12 miles) carpooled 250 days a year, the potential savings in a two-person carpool could exceed $1,500? [source: rideshare.org] TravelWise strategies like carpooling, trip-chaining, teleworking, and alternative transportation can all reduce the amount of fuel you use, resulting in more money in your pocket. Solo commuters have a large impact on our population, from traffic congestion and pollution to increased stress levels. Deciding to use an alternative form of transportation not only benefits your physical and mental health but the entire community. Sometimes a little competition is just what you need to jump-start new habits.While Utah’s air quality is no laughing matter, the challenge is one way to amp up your daily routine and see how many miles and dollars you can save just by making more air-conscious decisions. Get your coworkers involved and see how easy it is to reduce emissions and help Utah’s air. Make clean air your business this winter. Challenge yourself and your co-workers to take part in the Clear the Air Challenge. The challenge starts Feb. 1.